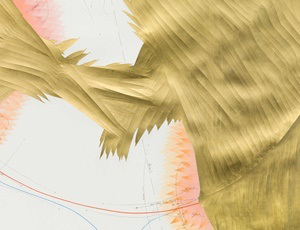 Jorinde Voigt channels external pulse and physical movements into complex drawn notations, featuring webs of interconnected thoughts, forms and words. Perhaps stemming from musical scores or codified system of classification, each of her carefully wrought matrices of colour and line combines elements of gestural chance with highly ordered empiricism, gleaned from the worlds of culture, science, music, history and literature. Whether the starting point is Goethe's Faust, the flight of an eagle (Adler flight), a series of walks, or a simple kiss (Two kissing), Voigt's multi-layered diagrams of each subject so take into account wind speeds, the Fibonacci sequence of numbering, or her bodily interactions with the oversized sheets of paper being worked upon. The intensity and oft geometric intentionality of her hand-scribed mark-making belies the ethereal intangibility of each work, with splashes of gold or silver refuting obvious figurative comparisons, recalling instead the arcane endeavours contained in illuminated or annotated manuscripts. Shifting into sculptural installation, Voigt maintains ago systematic structures and temporal processes, creating objects as equivalencies for seeking non-visual concepts as Grammatik (Grammar) or Collective Time (both 2010). Her desire to translate, transcribe and record essentially incommunicable phenomena – including musical dynamism, philosophical notions, personal emotions or her own interior monologue – leads, not to chaos, but rather to a collision between the bygone idealism of compartmentalised modernism and the realisations of a post-modern, universal condition in which everything is interdependent ultimately. Jorinde Voigt was born in Frankfurt am Main and lives and works in Berlin. Recent solo exhibitions include St. Matthäus-Kirche, Berlin, Germany; Mao Space, Shanghai, China, and David Nolan, New York, USA (all 2018); Kunstraum Innsbruck, Austria (2016); Kunsthalle Krems, Austria (2015); MACRO Museo d'Arte Contemporanea, Rome, Italy (2014); Langen Foundation, Neuss, Germany (2013); Royal Ontario Museum, Toronto, Canada (2012); Von der Heydt-Museum, Wuppertal, Germany (2011); Gemeentemuseum, The Hague, Netherlands (2010). 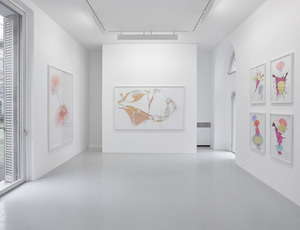 Voigt has participated in major group exhibitions at Pelaires Centre Cultural Contemporani, Palma, Spain and Villa Schöningen, Potsdam, Germany (both 2018); Lyon Museum of Contemporary Art, Lyon, France and Finnland-Institut, Berlin, Germany (both 2017); Latvian National Museum of Art, Riga, Latvia and Stedelijk Museum voor Actuele Kunst, Gent, Belguim (both 2016); Morgan Library & Museum, New York, NY, USA and Albertina Museum, Vienna, Austria (2015); at the Moscow Museum of Modern Art, Moscow, Russia (2014); Centre Pompidou, Paris, France (2013); Bonnefantenmuseum, Maastricht, Netherlands (2012); 54th International Art Exhibition, Venice Biennale, Italy (2011); Kunstmuseum Bonn, Germany (2010); Museum Folkwang, Essen, Germany (2008). 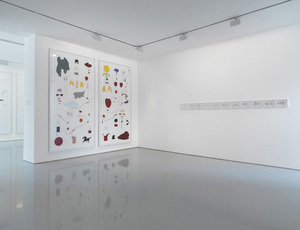 Voigt's work is featured in a number of collections worldwide, including the Museum of Modern Art, New York, NY, USA; Art Institute of Chicago, IL, USA; Centre Pompidou, Paris, France; Staatliche Graphische Sammlung, Munich, Germany; and Kupferstichkabinett, Berlin, Germany, among others. In 2012, she received the Daniel & Florence Guerlain Contemporary Drawing Prize, and in 2014, she appointed the Professor for Conceptual Drawing and Painting at the Academy of Fine Arts, Munich, Germany. Africa-Series Ink on paper 29.6 x 60 cm / 11 5/8 x 23 5/8 in. Ink, gold, pencil on paper 77 x 56 cm / 30 3/8 x 22 in. Ink, China ink, feathers, oil pastels, pastel, pencil on carton 182.5 x 252 cm / 71 7/8 x 99 2/8 in. Ink, feathers, oil pastels, Indian ink, pencil on paper 91.5 x 126.5 cm / 36 x 49 7/8 in. Ink, China ink, gold leaf, oil pastel, pencil on paper 102 x 66 cm / 40 1/4 x 26 in. Ink, feathers, oil pastel, pencil on paper 208 x 482 cm / 80 7/8 x 189 3/4 in. Ink, oil pastel, pastel, pencil on paper 180 x 140 cm / 71 x 55 1/8 in. Ink, paint, pastel, pencil on paper 130 x 90 cm / 51 1/4 x 35 3/8 in. Ink, oil pastel, pastel, pencil on paper 210 x 140 cm / 82 5/8 x 55 1/8 in.